Both Rolling Hills and Rolling Hills Estates were part of the original Rancho San Pedro and the Rancho de los Palos Verdes ( See the History of the South Bay for a discussion of the original Indian inhabitants of the Palos Verdes Peninsula and the original Spanish land grant Ranchos ). They were also part of the original Palos Verdes Project, totaling approx. 16,000 acres, which was the original master plan for the Palos Verdes Peninsula, which Mr. Frank Vanderlip had acquired with other investors in 1912. 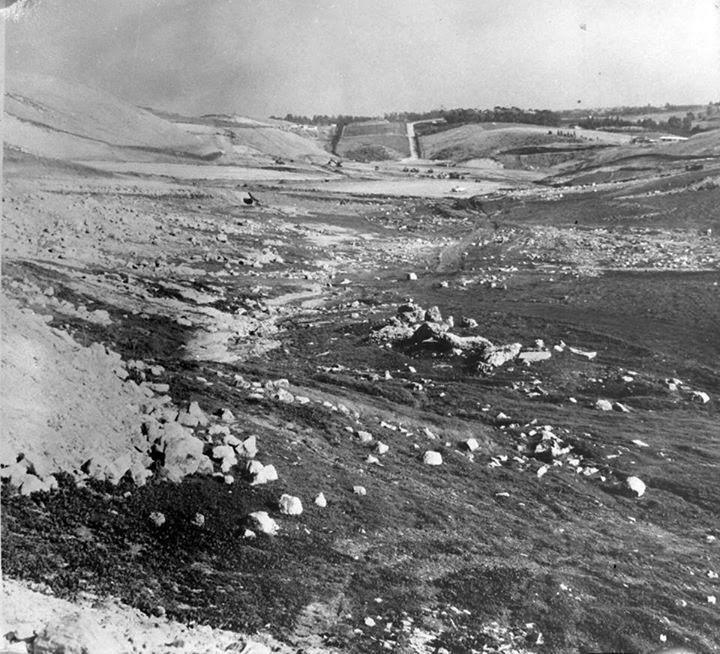 In 1922, Frank Vanderlip sold 3,225 acres of the Palos Verdes Project to investors that became the City of Palos Verdes Estates, but retained the other 13,000 acres for future development, which included the areas on the Palos Verdes Peninsula that ultimately became the cities of Rolling Hills Estates and Rolling Hills. 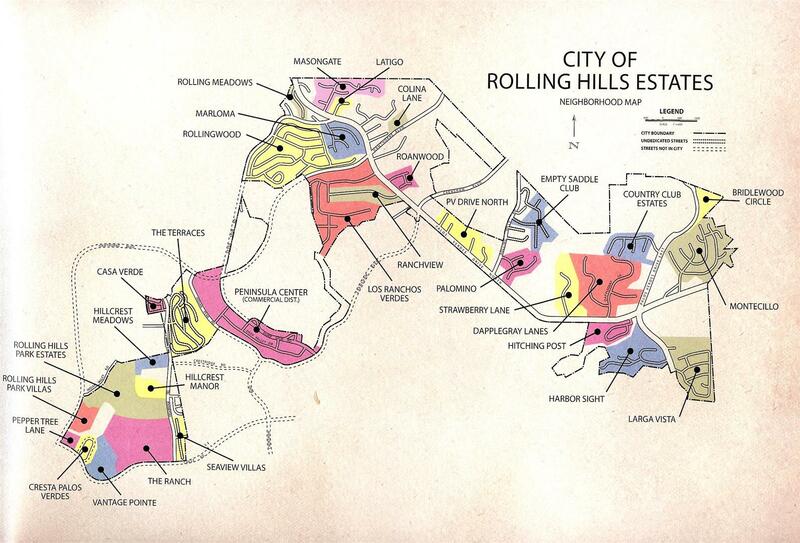 The City of Rolling Hills was incorporated in 1957. The Rolling Hills City Hall was constructed in 1967. It is a gated community designed to preserve the equestrian lifestyle. Most of the homes in the city consist primarily of luxury ranch style homes, and many have been built to accommodate the boarding of horses. The city maintains an extensive system of riding trails throughout the community. The person most responsible for the character and planning of Rolling Hills was A.E. Hanson, who was the General Manager of the Palos Verdes Corporation beginning in March 1931. In 1931, Crest road was completed, which gave access to one of the few structures then in existence in Rolling Hills, a run-down abandoned ranch house on the north side of Crest road, which had been originally built in the mid-1880's. Mr. Hanson renovated and expanded this ranch house in the early 1930's for his family, and named it "Rancho Elastico". 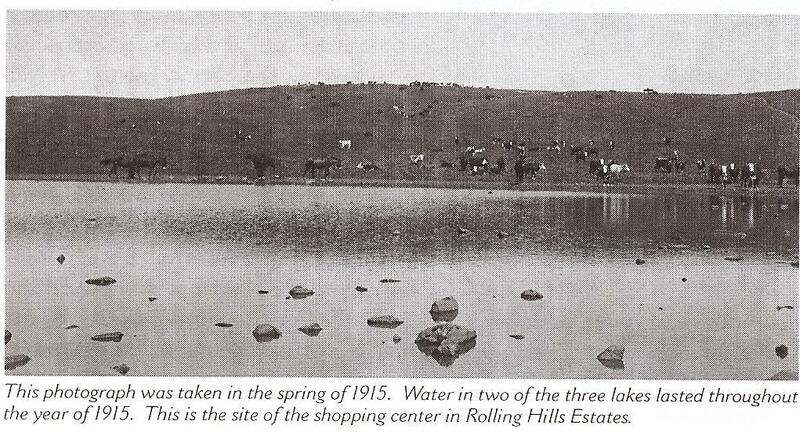 The only other structure in Rolling Hills was the old Harry Phillips ranch headquarters, which was near the present day Empty Saddle Club (which was formed in 1941). Mr. Phillips had been the Rancho de los Palos Verdes ranch manager, appointed by George Bixby in 1894. 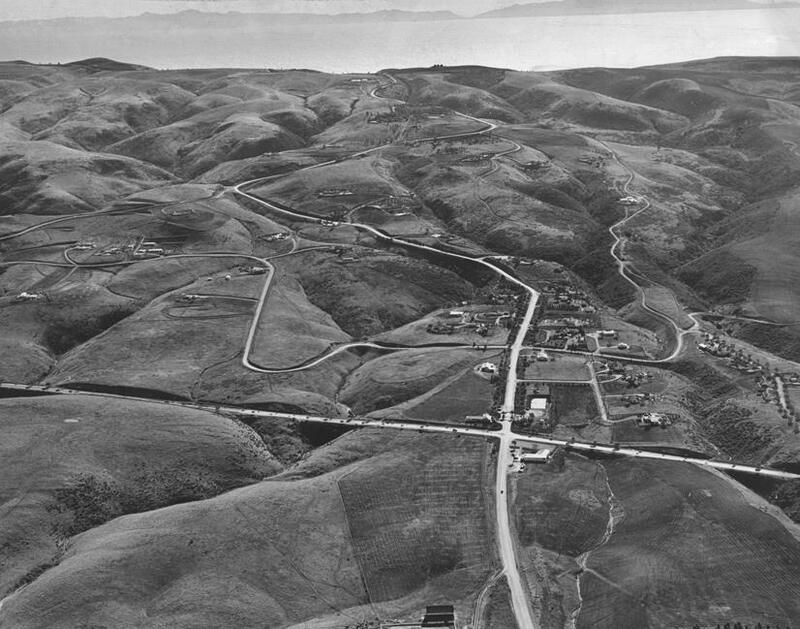 Mr. Hanson, shortly after he became manager of the Palos Verdes Corporation, in 1931, laid out the boundaries of a development he would later name "Rolling Hills", which boundaries extended from Palos Verdes Drive North (which was constructed from 1933 to 1935) to Crest Road, and from George F Canyon on the east and Agua Negra canyon on the west. Palos Verdes Corporation's main investor was Frank Vanderlip and owned the balance of the 13,000 acres of the Palos Verdes Peninsula which was not part of the Palos Verdes Project (which would later become the City of Palos Verdes Estates and also consisted of the Miraleste area of the City of Rancho Palos Verdes). The Rolling Hills development consisted of approx. 600 acres and 100 home sites. The first gatehouse for Rolling Hills was constructed in 1935 just off of Palos Verdes Drive North. Mr. Hanson dictated that all homes in Rolling Hills would be painted white, and that the lots would be fenced in by a 3-rail white fence. At this time, there were almost no trees in Rolling Hills, and to promote their planting, Mr. Hanson gave away 5 olive trees to each purchaser of a home site in excess of 5 acres. Entrance gate to Rolling Hills, Palos Verdes Drive North and Rolling Hills Road. Note almost complete lack of trees and View of Catalina Island. Rolling Hills Road ended at Crest Road at the top of the Peninsula. In 1939, Mr. Hanson developed the first homes to be sold in Rolling Hills (all previous sales consisting only of land for homes), a development called "Williamsburg Lane", which he named after Williamsburg, Virginia. Mr. Hanson had the homes designed in the manner that he had seen in Williamsburg, Virginia. This development consisted of 14 homes, and were 1.5 acres and 3 bedrooms and 2 baths, and were offered for $8,750. In December 1940, at the depths of the Depression, the Palos Verdes Corporation was deep in debt for unpaid property taxes, and Frank A. Vanderlip, Jr., Frank Vanderlip's eldest son who controlled the Palos Verdes Corporation after the elder Mr. Vanderlip's death in 1937, told Mr. Hanson to do whatever was necessary to raise money to pay these taxes. 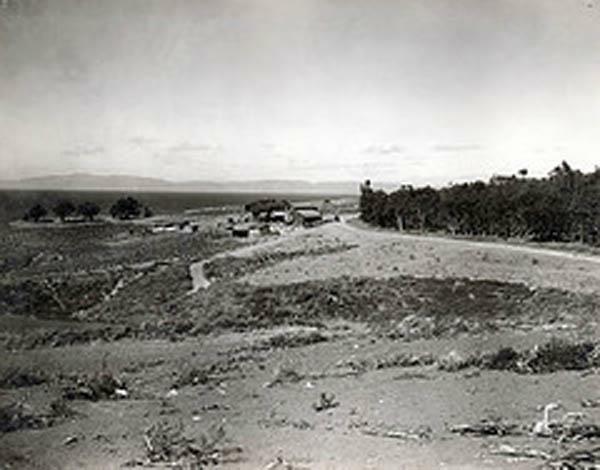 At that time, Mr. Hanson advertised one acre sites, near the Los Verdes Country Club, for sale for $185, however received no takers!. Development of Rolling Hills accelerated when Kelvin Vanderlip, another of Frank Vanderlip Sr.'s sons, was appointed, after the war in 1945, President of the Palos Verdes Corporation and in control of the development of Rolling Hills as well as the early neighborhoods in the current city of Rolling Hills Estates along Palos Verdes Drive North.To this day, the vision of Mr. Hanson and the Vanderlip family for Rolling Hills has been maintained. 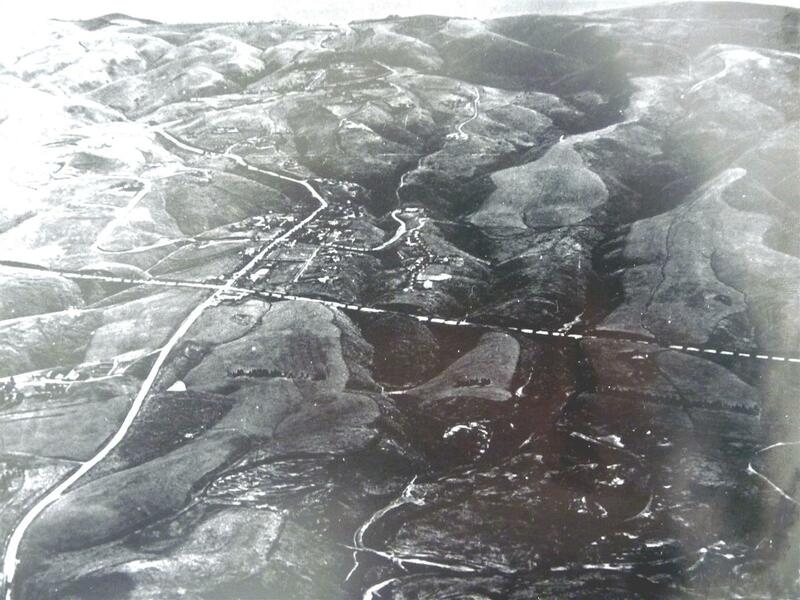 Aerial shot of the entrance to Rolling Hills looking up Portuguese Bend Road, about 1935 (Dicalite mine in left foreground). In 1894, Harry Phillips Sr. built and occupied the first permanent residence on the Palos Verdes Peninsula, a small cottage near the present Rolling Hills City Hall. 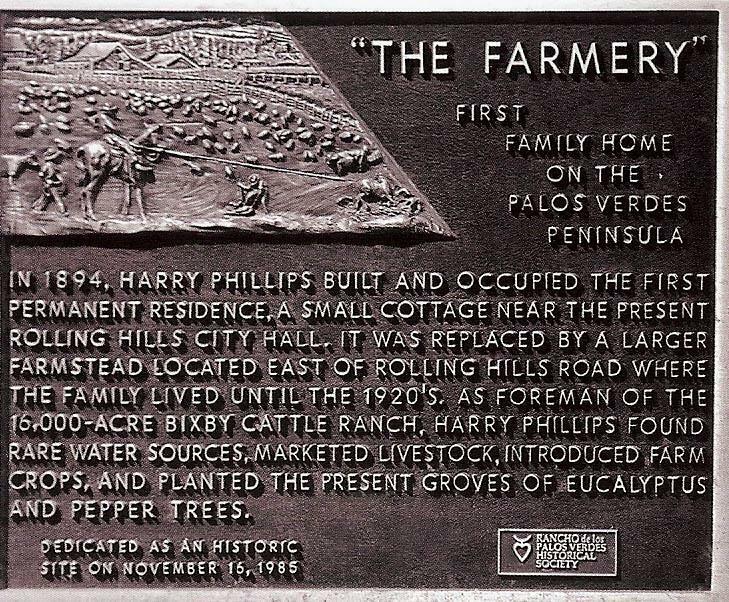 It was replaced in 1910 by a larger Farmstead called "the farmery" which was built in Blackwater Canyon on the current-day Lariat Lane just southeast of the intersection of Palos Verdes Drive North and Rolling Hills Road where the family lived until the late 1920's. Harry, an Englishman, came to the Palos Verdes Peninsula in 1887, settling in San Pedro. The Peninsula, covered with chaparral, had almost no trees, and water was scarce. 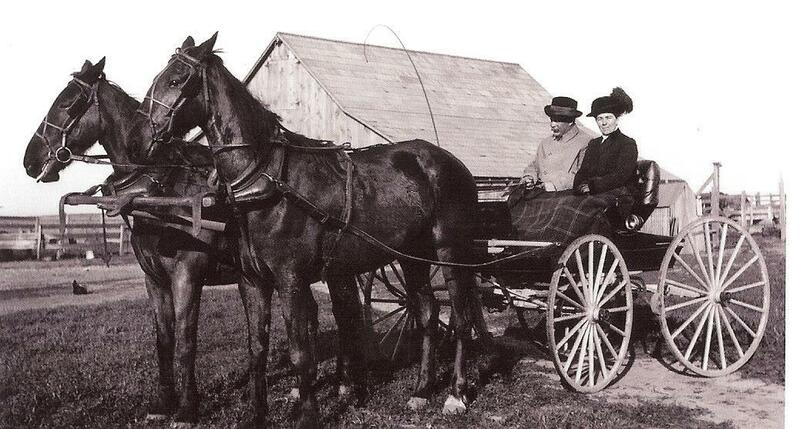 Harry Phillips Sr. was hired by the Bixby family in 1894 as the foreman of the 16,000 acres Bixby Cattle Ranch. Phillips got the job partly because of his knowledge of the Peninsula's limited water resources. The Bixby family had acquired the land a few years earlier from the Sepulveda family, who had title to an old Spanish land grant.Phillips was responsible for planting the first groves of eucalyptus and Pepper Trees in the City of Rolling Hills Estates Phillips also was responsible for planting for firewood the extensive groves of eucalyptus and pepper trees in what is now the Valomonte area of Palos Verdes Estates..
Phillips brought agriculture to the region. He upgraded the Bixby cattle by introducing thoroughbred Hereford bulls and marketed the beef to a growing, hungry Los Angeles and had a herd of approx. 2,000 head of cattle. Harry farmed large areas of hay and barley, as well as lima beans and other dry farming crops. Phillips encouraged Bixby to lease coastal portions of the ranch near Portuguese Bend to Japanese farmers for $10 an acre. About forty families took him up on the offer, including longtime South Bay farmers the Ishibashi family. They raised a variety of vegetables, particularly tomatoes and peas. The Bixby Ranch was sold in 1913 to New York banker Frank A. Vanderlip Sr., who ultimately developed the Peninsula. 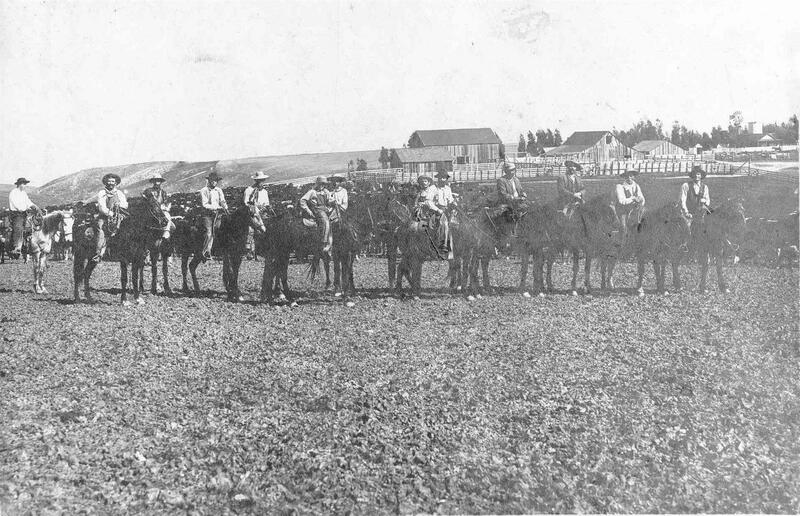 Phillips continued to run the ranch until 1920. Two years later, he died of cancer in Lomita at age 59, according to his grandson, Harry Phillips III. From the early 1900's through 1945, the area now known as The Peninsula Center on Silver Spur Road was periodically covered by seasonal lakes. In Elin Vanderlip's memoirs, she states that the lakes were drained in 1946 and replaced by a detention camp for prisoners, mainly who were there for missing support payments to their ex-wives. Other records indicate that some of the labor for the construction of Crenshaw Boulevard into Palos Verdes was provided by workers from this detention "honor" camp. 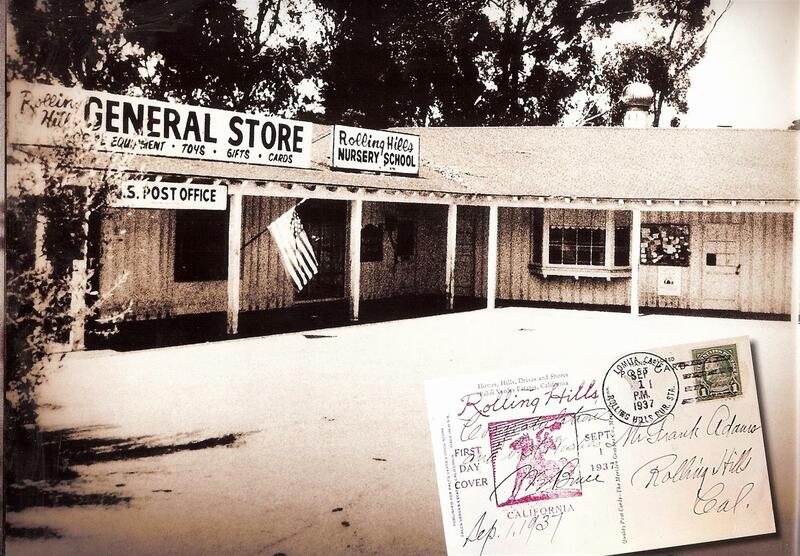 The first commercial buildings constructed in what would become the City of Rolling Hills Estates was The General Store, at the corner of Rolling Hills Road and Palos Verdes Drive North in 1937. The General Store, to this day, is an integral part of the equestrian community of the City. When World War II began, the residents of the Palos Verdes Peninsula prepared for war. In 1943, control of the Palos Verdes Corporation was passed to Harry Benedict, a friend and business associate of Frank Vanderlip Sr. In 1945, Kevin Vanderlip took control of the Corporation as President. Kelvin believed in furthering his father's vision of the development of the Palos Verdes Peninsula into large estate sized lots such as were being sold in the Rolling Hills development. Frank Jr., however was unwilling to sell off individual lots due to the extremely high income tax rates on ordinary income at that time ( in excess of 90% at higher income levels). In 1951, Narcissa Vanderlip, the mother of Kelvin and Frank Jr., appointed Frank Jr. as President of the Palos Verdes Corporation and demoted Kelvin to Vice President. Kelvin then promptly resigned at his displeasure of this decision, and went on to a very successful career at the architecture firm Welton Beckett until his death from lung cancer in 1956. Probably the greatest single event that would shape the future of Rancho Palos Verdes occurred in 1953. Since 1944, the Great Lakes Carbon Corporation had leased a 300-acre tract of land on the north side of the Peninsula for mining of diatomaceous earth (the remnants of this mine can be seen at the southwest intersection of Hawthorne Blvd. and Via Valmonte). Although this mines resources had nearly been exhausted, another rich deposit was known to exist on a 165-acre tract near the crest of the Peninsula. For two years, the Great Lakes Carbon Corporation had been unsuccessfully attempting to purchase this property from the Vanderlip family. Finally, Frank Vanderlip Jr. agreed to sell, provided that Great Lakes purchase all of the stock in the Palos Verdes Corporation for about $9 million, so that the sale would be taxed at capital gains rates. Upon completion of the transaction in December 1953, Great Lakes Carbon Corporation suddenly owned 6,800 acres of prime undeveloped land, all that was left of the 16,000 acres bought from Mr. Bixby, with the exception of 500 acres retained by the Vanderlip family in the Portuguese Bend area. In response to the changing circumstances, the other three Peninsula cities of Palos Verdes Estates, Rolling Hills and Rolling Hills Estates incorporated before the largest building boom began in the late 1950 and early 1960s.The City of Rolling Hills Estates officially became Los Angeles County's 60th municipality on September 18, 1957. In that first year, the City's population totaled only 3,500; but its new citizens were united in their concern over maintaining the community's rural atmosphere characterized by rolling hills, vast open spaces and white fences. Fueled by the master plan created by the Great Lakes Carbon Corporation and the burgeoning economic growth occurring in the South Bay area, the remaining unincorporated area on the Peninsula began to develop rapidly and in ever-increasing densities. On April 1, 1950, the Palos Verdes Peninsula had about 6,500 residents, and by June 1967, the number of residents had grown to approx. 54,000. 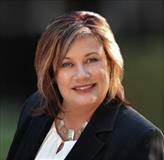 Great Lakes Carbon Corp. began to operate its real estate holdings through a subsidiary, Great Lakes Properties, Inc. In addition to its development activities on the Palos Verdes Peninsula, they also developed the Del Amo Financial Center in Torrance. In September 1955, Palos Verdes Properties, Inc. sold the first 117 acres of the 6,800 acres that Great Lakes Carbon Corp. and Transamerica Development had purchased in 1953 to McCarthy Co., land developers. In May 1956, one of the largest land sales took place with Ed Zuckerman and other investors for 1,000 acres known as Grandview Palos Verdes, located near Montemalaga Drive and Silver Spur Road for $6 million. The Monaco development of 180 acres was begun in September 1959. By 1967, only about 1,600 acres remained to be developed. Road construction moved forward rapidly in the late 1950's and through the mid 1960's..Construction of Crenshaw Boulevard up a canyon from Palos Verdes Drive North to Silver Spur road commenced in mid June 1950 and was completed in September 1951, utilizing labor for the construction by inmates at County Detention Camp No. 7 in the Peninsula Center area. . Construction of the extension of Crenshaw Blvd. to Palos Verdes South in the mid 1950's triggered the disastrous Portuguese Bend Landslide which continues to this day. 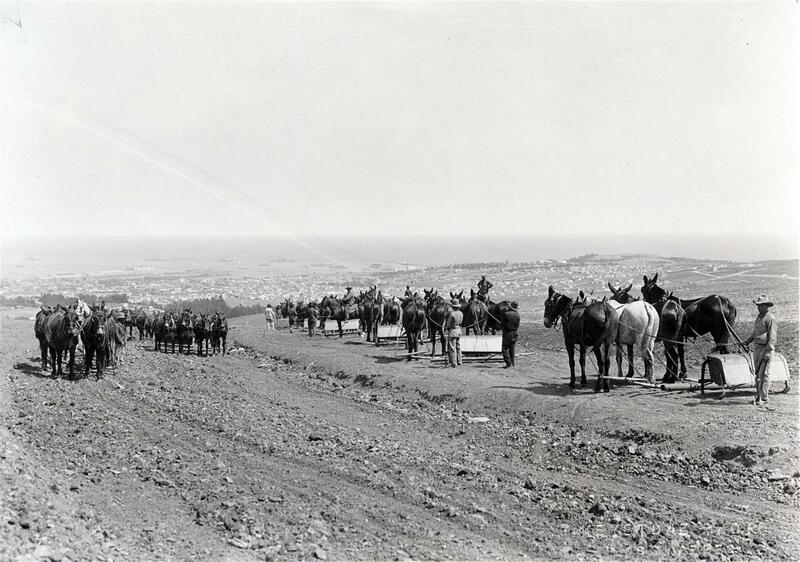 Crest road, constructed by the developers of the Palos Verdes Project, ran from Palos Verdes Dr. East across the top of the hill and then down to Palos Verdes Drive West along the current lower portion of Hawthorne Blvd. Prior to extending Crenshaw up the hill, Crenshaw had extended to the gated entrance to Rolling Hills, and that portion of Crenshaw was then renamed Rolling Hills Road. Construction of Hawthorne Blvd. through the Peninsula was completed in several segments. Hawthorne Blvd. was completed from Silver Spur Road to Crest in 1959. 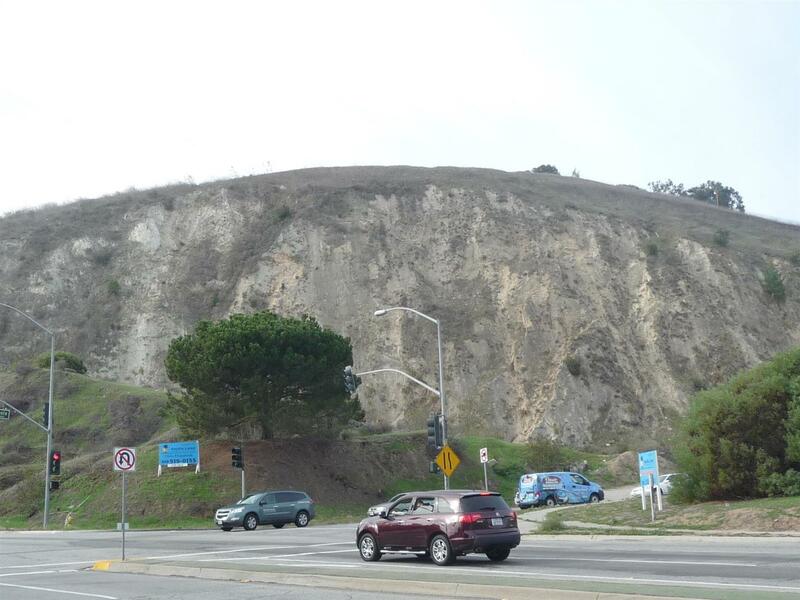 The segment from Palos Verdes Drive North to Silver Spur Road was completed in 1961. After several years of planning, the final segment extending Hawthorne Blvd. from Newton in Torrance to Palos Verdes Drive North was completed in 1965. Peninsula Center, Silver Spur Road and Hawthorne Blvd. Left, 1960's, Right, Current Google Earth view. Note that neither the High school opposite the corner or the Shopping Mall have been built in the first photo. Annexation of new areas to the City was another ongoing concern during the City's early years. In 1958, the Montecillo, Chandler Quarry, Country Club Estates and northern Masongate areas were added to the eastern and western portions of the City. 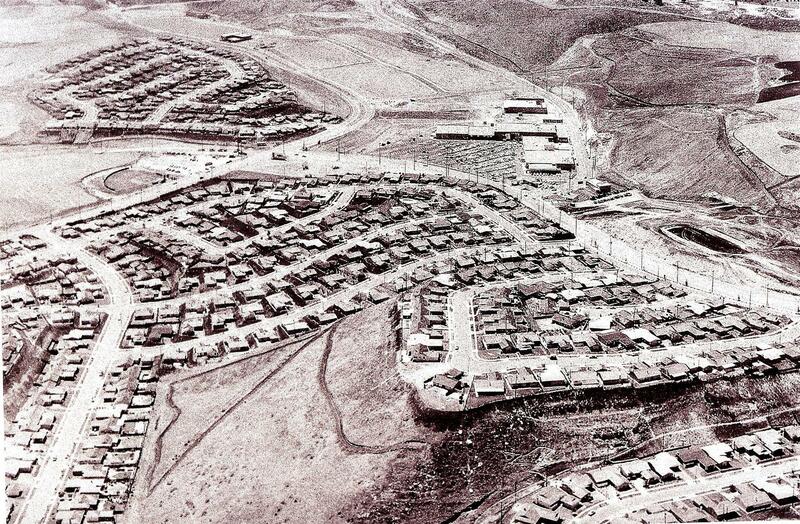 Later annexations from 1960-66 included the research and development land behind the Northrop Corporation; the Peninsula Center, Harbor Sight, the Ranch, Rolling Hills Park Estates, Highridge, Hillcrest Manor, Hillcrest Meadows, Terraces, and Cresta Verdes areas. In 1982, the site of the former Palos Verdes Landfill was annexed to assure that City concerns regarding this closed facility would be recognized. Don Wallace, a ham radio pioneer who worked as an amateur radio operator since 1913, operated W6AM as a ham radio operation from his land atop the Palos Verdes Peninsula at the junction of Armaga Springs road and Highridge road. His antennae farm included a huge installation of rhombics antennas each perched upon telephone poles, some over 150 feet tall. 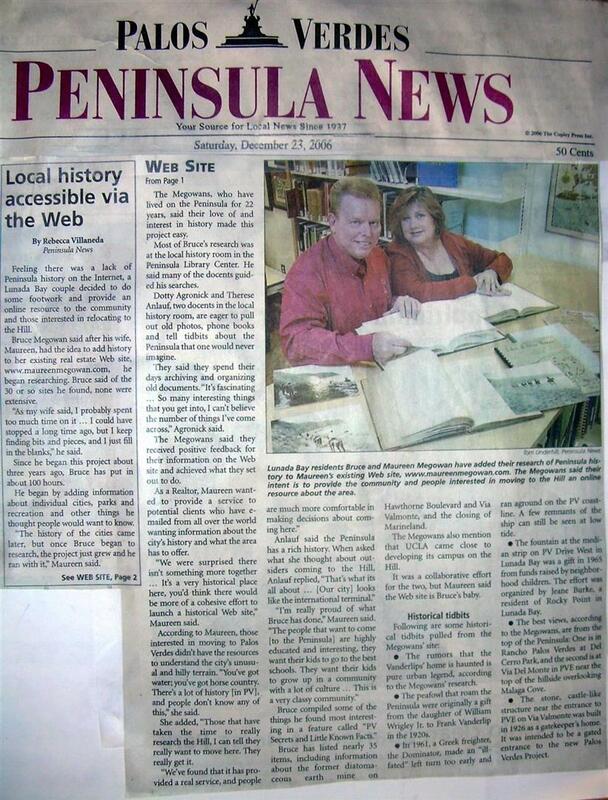 The site was originally acquired in the 1930's by Press-Wireless, owned by a group of newspapers to receive news dispatches from around the world. During WW II, the War Department used the facilities to communicate with battle operations in the Pacific, relayed to Pearl Harbor. In 1945, Don Wallace bought the land from Kelvin Vanderlip who, in order to control deed restrictions, had bought the land from Press-Wireless. The station in 1945 had 120 acres of land with 16 rhombics, the longest being 1500 feet (end to end). This 1500 foot rhombic is widely believed to have been the largest beam antenna ever in amateur service. He had 61 telephone poles, each at 80 feet and another 90 feed line poles (25 feet high each). These antennas were fed by 52 MILES of feed lines. In 1942, William Arthur Schuler, 23, who lived in Palos Verdes Estates and worked for Press-Wireless, was arrested by the FBI for spying.l He had offered to transmit messages to foreign agents using the Press-Wireless transmitters. He got six years in the federal penitentiary. In 1962, Don had to sell 95 of the acres (to pay the property taxes) and he collected the grand sum of $100K for the 95 acres. Don then consolidated his antennas. He installed ten 140 foot poles on the perimeter of his remaining 25 acres with rhombics layered every 6 feet in various directions with rhombics beginning at the 90 foot level and going in layers of 6 feet up to 140 feet high.. Height of the rhombics varied from 100 to 140 ft. In the late 60's or so. Don operated his array up until he died in 1985. 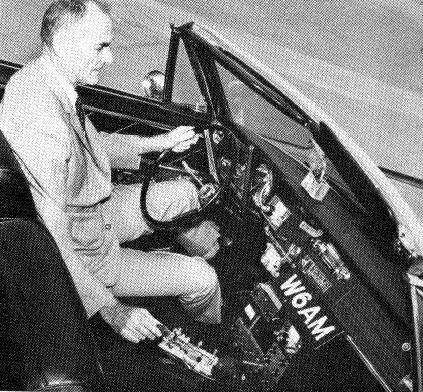 Don Wallace also operated his ham radio from his car. The land which Mr. Wallace owned is today several condominium and luxury home developments including The Ranch. In 1960, General Telephone and Great Lakes Property Inc. (which owned thousands of acres of land on the Palos Verdes Peninsula, purchased from Frank Vanderlip, Jr. and the Palos Verdes Corporation in 1953) proposed a 400 acre "campus like science center" near the intersection of Hawthorne Boulevard and Crest Road. They spent $250,000 on glossy ads for the "Palos Verdes Research Park" (see ad below). The first tenant was Nortronics division of Northrop Corp., which planned a 100 acre development. 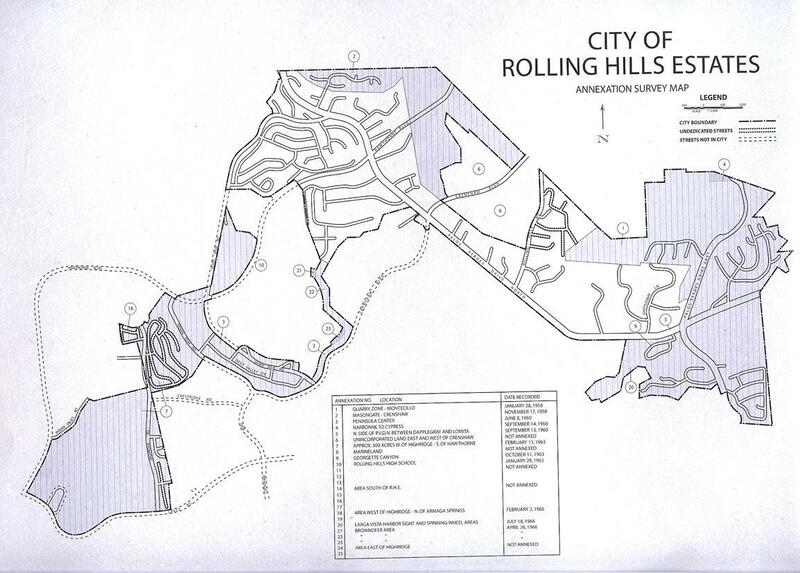 When the developers tried to get the county to relax zoning standards (this area was not yet part of Rolling Hills Estates) to allow light manufacturing, the city council of neighboring Rolling Hills protested. Great Lakes Property Inc. relented and then decided to pursue home construction on the balance of the property. Rolling Hills Estates voters approved the annexation of 375 acres of this property in March 1963. Great Lakes Property Inc., after no other companies followed Northrop's interest in the property, announced that it would sell 107 acres of land as a site for what was then being called "Palos Verdes State College". As discussed below, this sale was never completed. Gradually, the balance of the land originally planned for the Palos Verdes Research Park was parceled off and sold for home development. In 1991, Northrop decided to sell its 34 acres that it still occupied, and this land was later developed into the Vantage Point subdivision. 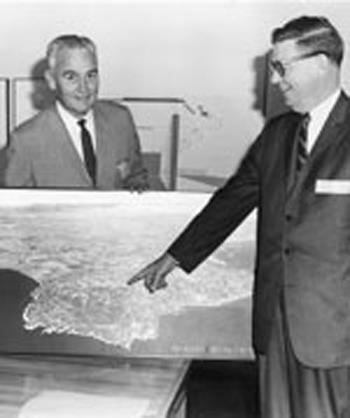 In 1963, Great Lakes Property, Inc., had planned to sell 107 acres of land near the intersection of Hawthorne Boulevard and Crest road at the top of the Palos Verdes Peninsula as a site for what was originally named South Bay State College and then renamed California State College at Palos Verdes (CSCPV). The State of California had allocated funds to acquire this land and had actually begun classes for 27 freshmen and 14 juniors in a bank building in the Peninsula Center area in September 1965..
After extensive planning and beginning eminent domain acquisition of the site, due to rising land values this site was abandoned for consideration in mid 1965.Three other sites on the Palos Verdes Peninsula were then considered, including one on the northern slopes of the Peninsula including the Chandler gravel pit and the County sanitary landfill on unincorporated land between Crenshaw and Hawthorne Boulevards, as well as on land overlooking Palos Verdes Drive South in Rancho Palos Verdes adjacent to San Pedro. Other potential sites included Fort MacArthur in San Pedro and Dominquez Hills. 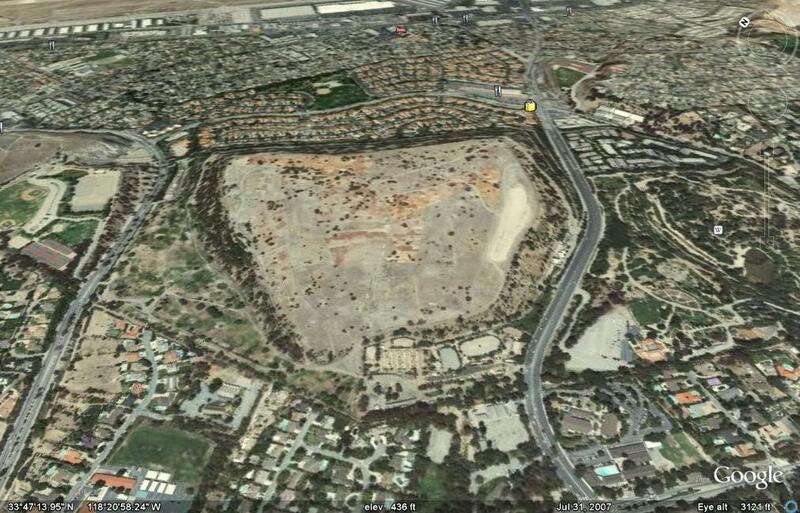 The former Palos Verdes Landfill is located between Crenshaw and Hawthorne Boulevards between Palos Verdes Drive North and Rolling Hills Road. 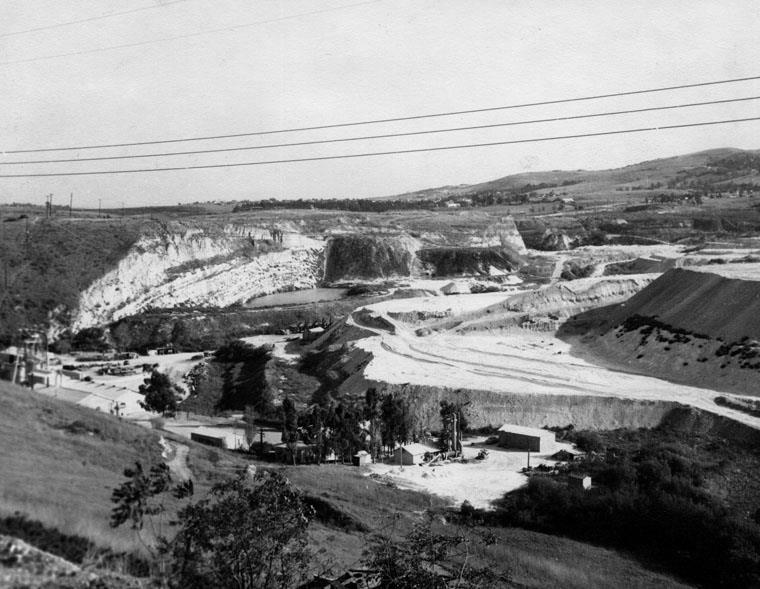 During the early 1900's the Dicalite Company began mining diatomaceous earth ( also known as dicalite ) in the area now occupied by the South Coast Botanical Gardens off of Crenshaw Blvd, the former Palos Verdes Landfill site between Hawthorne and Crenshaw, and Ernie Howlett Park off of Hawthorne Blvd, , but at this time it was mostly surface mining. By 1929, open-pit mining was being pursued. In 1944 the mine operation was sold to the Great Lakes Carbon Company (“Great Lakes”) and mining began in earnest. By 1956, production of the mine declined and the site was sold to the County of Los Angeles, which then converted the site to a Sanitary Landfill in 1957 . On Dec. 31, 1980, the Palos Verdes landfill officially closed after having accepted a total of 24 million tons of trash since its opening. Partial restoration of the 291 acre site began with the opening of the 83 acre South Coast Botanic Garden on the eastern end of the site in April 1961, and the construction of the 35 acre Ernie Howlett Park on the site's western side, a project fully completed in 1982. The remaining 173 acre site between Hawthorne and Crenshaw , however, still remains unimproved except for some horse stables. Recently, the County had considered constructing a golf course, however local opposition killed the project. The area known as Butcher Hill at the southwest corner of Hawthorne Blvd and Via Valmonte , beginning in 1944, before Hawthorne was extended past the current Via Valmonte in 1965, was part of the dicalite earth mine, and extended into the area now occupied by the Hillside Village shopping center. This is the last remnants of the dicalite open pit mining that had taken place on the north side of the Palos Verdes Peninsula. The County had considered constructing a golf course, however local opposition killed the project. 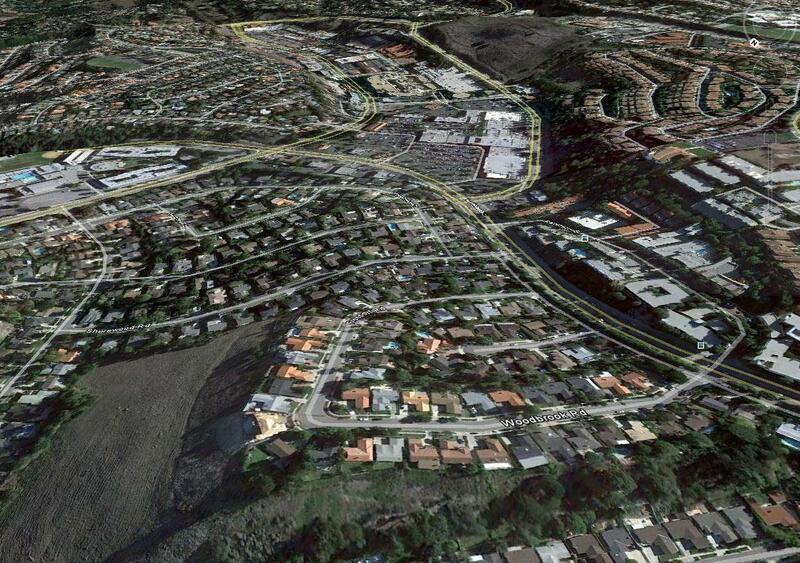 (See Palos Verdes Golf for a description of this proposed project ). An energy facility converts methane gas from the decomposing trash into energy on-site. Today there are 28 neighborhood areas within the City of Rolling Hills Estates, each with its own special character, architectural style, and Homeowners Association. These Associations often represent citizens directly before the City Council and serve as neighborhood social organizations as well.